In a little over two weeks, Black Friday will be upon us. Over the last couple of years, we have seen this day become flooded with deals on the latest and greatest in Android products, something that likely won’t change this year. 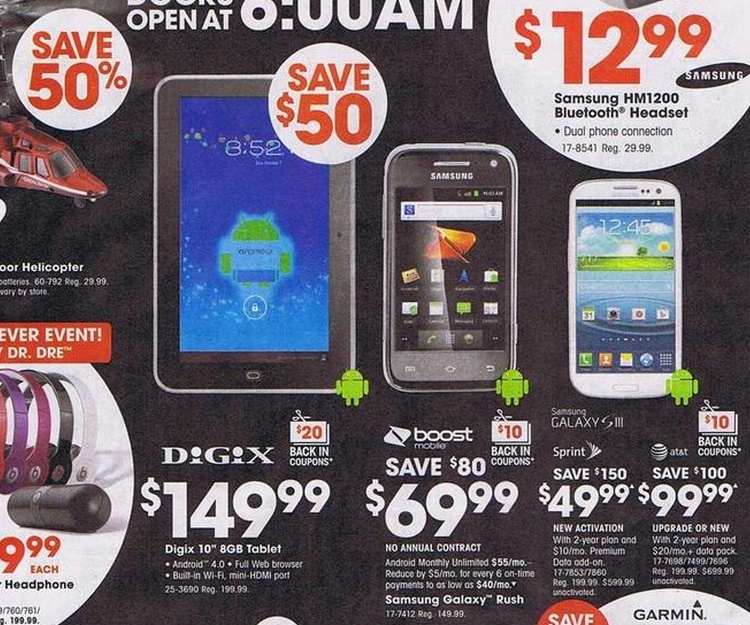 In fact, RadioShack’s ad has already been posted for the world to see, and as expected, includes a number of Android smartphones at rock bottom prices. The most interesting of the bunch may be the Samsung Stratosphere 2, which has yet to receive an announcement or launch date publicly from Verizon. We have covered it plenty, but here we are two weeks out from Black Friday without an official statement. If RadioShack is expecting to sell it for free, giving you a $100 savings, the phone will likely debut at $99 on 2-year contract. We should point out that this is the only device with a physical slideout keyboard on Big Red that we have heard of in months. Along with the Stratosphere 2, you’ll find the Galaxy S3 on Sprint and AT&T for $49 on new lines or $99 as an upgrade. 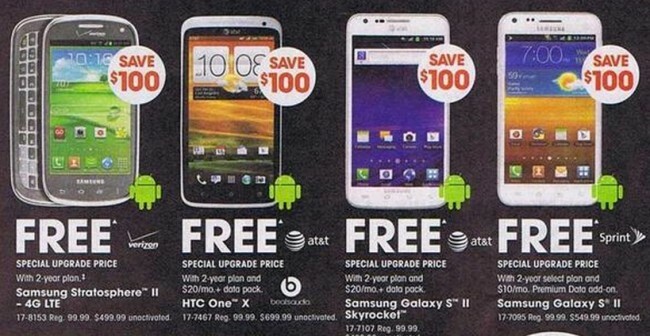 The HTC One X and Galaxy S2 will be free, plus you will also receive a $10 coupon for every $50 you spend at The Shack. We’ll do our best to bring you all of the hottest Black Friday deals.